Oh my goodness! It’s been more than 6 weeks since I last wrote a blog post and 7 since I last took part in What’s On Your Workdesk Wednesday. No sinister reasons for that. It’s just that it’s been a lovely summer here and I’ve been busy outside. Most of the time it was too hot to be in the attic anyway. Also, I’ve got a little bored with telling my story. It seems, no sooner have I decided on how I think things/I work than I change my mind and see things anew. Too much blah, blah, blah going on. Anyhoo . . . I’m back and, since it Wednesday, here’s what’s on my workdesk. I’m particularly proud of the crochet. No one’s more surprised than I that I’ve created that. It all came about because I’m taking Ed Dale’s challenge which entails me writing a Kindle book in 30 days and I’ve ended up writing one about making bunting. Yep. Bunting. I started out with some deep and meaningful book ideas, then progressed into something about artists block and finally ended up settling on bunting. If you’d told me, even a few weeks ago that I’d be making bunting, let alone writing about it I would have laughed in your face. Bunting? Moi? Noooooooo. Not me. I do meaningful quotes on pictures and stuff. I don’t do trivial. Well, ha, ha, ha. The joke’s on me. I’m crocheting granny squares and loving it, not to mention keeping myself awake at night trying to come up with ideas of how to turn Monopoly houses into flags. See what happens when I get out of my head? I end up in totally unexpected places and have a ball! Wishing you all a week full of quirky surprises! Ha, ha, ha! Never say never. Everywhere you look you’ll see bunting now! Or is it not that big in Holland? Glad you like the map ones. I’m about to put them into my shop so it’s good to know that at least one other person on the planet likes them! Lol, I LOVE bunting! Yours is great. I still have bunting up in my house from when we had my dads 70th birthday in July! It’s amazing how much bunting has really taken off isn’t it? I blame the Queen’s Diamond Jubilee myself! Oooh! 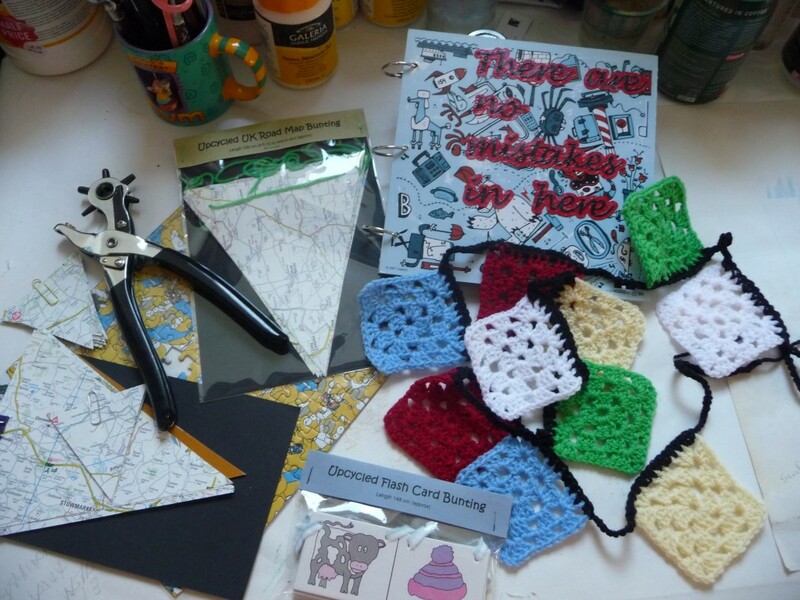 I have never seen crocheted bunting before – how fabulous! I love the colours! Thanks for sharing, I;m off to have a browse through your shop now! And why can’t bunting be deep and meaningful? See, you’ve got me pondering on that one!! Yep, I’m doing Christmas decs and yes, I’m cutting out by hand, but there is a template to use so it’s not at all complicated! Hope you can get back into your happy space more as we head into Autumn. Oh. Did I sound like I wasn’t happy? I’m most definitely am. Thanks for visiting! Deep and Meaning Bunting. Who knew? You certainly have quite the collection of bunting going on there. My hands down favorite is the granny square bunting. It is soo wonderful and silly too and why not? I tried to get my mother to show me how to make granny squares but she no longer remembers. ‘Tis just as well. I can hardly afford my one hobby now let alone take on another. And that quite the wicked tool you have there on your desk.